This time of year I pull out one of my most fun kitchen gadgets, an apple peeler/corer/slicer. It peels, it cores, it slices and all at once with just the turn of a handle. Push an apple onto the forked end of the shaft and a half-dozen turns later the peel is gone, the core is gone, the apple is sliced and ready for whatever next steps you have in mind. For me, that step is cutting through the apple “slinky” to create perfect apple halves. While these halves would be fine filling for a pie, my plan is to arrange them on food dehydrator trays, set the dehydrator temperature at about 130 degrees and four or five hours later have tasty dried apples. My apple parer isn’t an original Goodell, sad to say. It’s a Progressive Kitchenwares copy, but David Goodell’s ingenuity still pleases me as I happily peel, core and slice apples one after the other. The dried apples I’m making now, a batch a day for the next week or so, are all meant for Christmas gifts. A few years ago I began adding dried apples to the gift box for my brother and his family and they were such a hit that I’ve added them to the gift boxes for six other families, both siblings and in-laws. The soft, fruit-leather texture and the intense apple flavor of each dried slice make them a delicious snack, but my brother also puts them in a ground pork pie and says the flavor they add is great. I’m pleased by their popularity because these dried apples are a way to share the bounty of our kitchen garden orchard with family living far away. Melrose is the apple variety I use for drying. They are latest-harvest apple we grow, picked in mid-October and stored in a cool place for six weeks or so while their flavor mellows. By late November, they are sweet and juicy and ideal for drying. They are also a nice round shape, a perfect fit for David Goodell’s ingenious parer. I’ll be sure to include his story in this year’s Christmas box. Thanksgiving dinner is about the turkey of course, and all the vegetable side dishes, and the pies. But there are also the little condiments, the tasty bites that serve as appetizers or add more flavors to the main meal. From my grandmother’s Thanksgiving table, I remember her homemade watermelon rind pickles, my mother’s bread and butter pickles, store-bought green olives stuffed with pimento, cranberries both jellied in the shape of the can and chunky in sauce, and most of all, I remember the toasted hickory nuts my family would bring. In the fall we’d gather bags of nuts from the shagbark hickory trees that grew along our road, my father would crack their hard shells in a vice, managing to pull out perfect nut halves, and my mother would toast them in butter, sprinkle them with salt and serve them in bowls. Even at the kids’ table there’d be a bowl of these special nuts. Some years, my sister Sarah who still lives near those shagbark hickory trees will send us a jar of hickory nuts in the fall, a very special treat. In years with no hickory nut gifts, Scott will blanch and toast almonds for an appetizer. 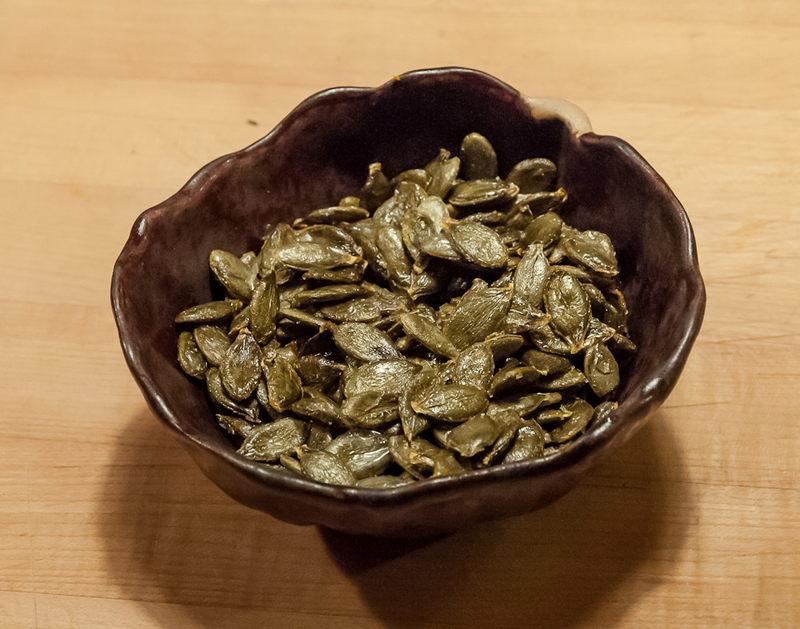 But this year, I have a new entry for the nut bowls: roasted pepitas. 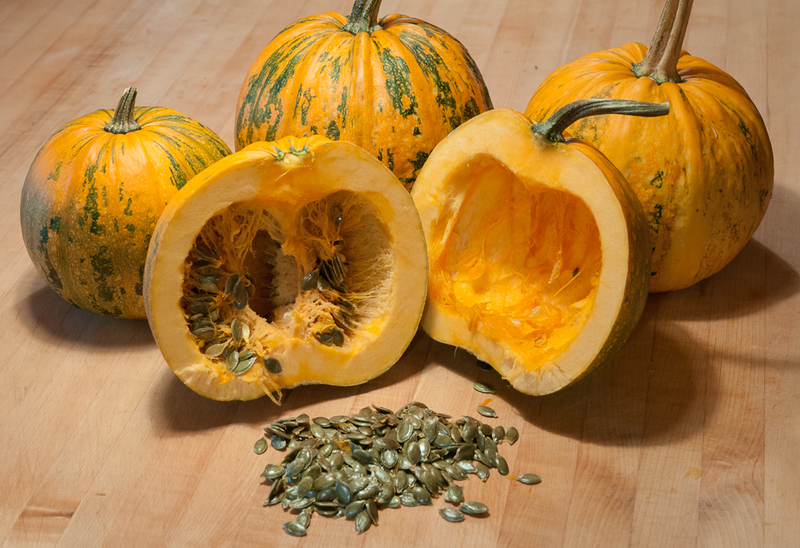 I’ve just spent an afternoon carving open a half dozen Kakai pumpkins, pulling out their large, hull-less, dull green seeds and roasting them. They are delicious, not quite the flavor of hickory nuts but still very rich and nutty. They’ll be perfect as an appetizer and later on the table, if there are any left. 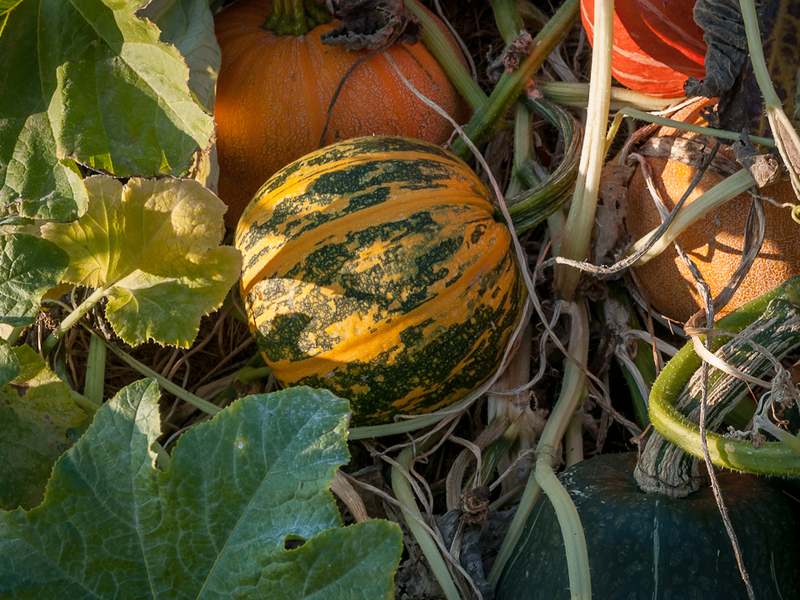 I learned about this variety of “naked seed pumpkins” last spring in a Barbara Damrosch column, http://www.washingtonpost.com/lifestyle/home-garden/pumpkins-can-be-used-for-more-than-just-decorations/2011/10/25/gIQAe2YYfM_story.html, and ordered seeds from Johnny’s: http://www.johnnyseeds.com/p-5701-kakai.asp where the description calls them “pumpkin nuts.” I’d never grown pumpkins for nuts so it was new territory. The three plants I started inside and then set out in the garden grew well and by late September the beautiful green-striped orange pumpkins were ready to harvest. It was tempting to keep them as decoration, but I’d come too far in the pepita adventure to stop so I cut them open. 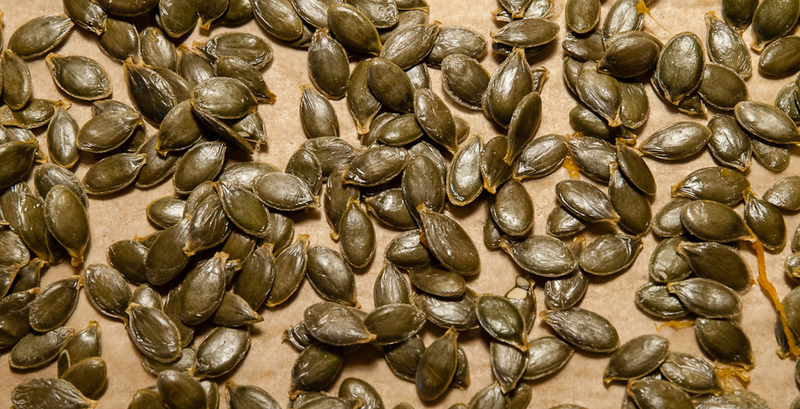 The surprisingly large, plump seeds were easy to slip from the stringy pumpkin flesh and arrange on a parchment-paper-covered sheet pan to dry for an hour or so before roasting in a 225-degree oven. I lightly coated one batch in olive oil and sprinkled them with a little salt. After half-an-hour in the oven, they felt crisp and tasted great. Once they’d cooled, they were even tastier. I also roasted a plain batch, no olive oil or salt. These were great too. I’m tempted to try roasting another batch in butter and sugar or a little maple syrup for a sweet treat to complement the savory. Scott will make some roasted almonds to accompany the roasted pepitas. Our friend Nancy is pickling carrots and beets for a sweet and sour appetizer and I may try a pickled winter squash recipe I just saw. 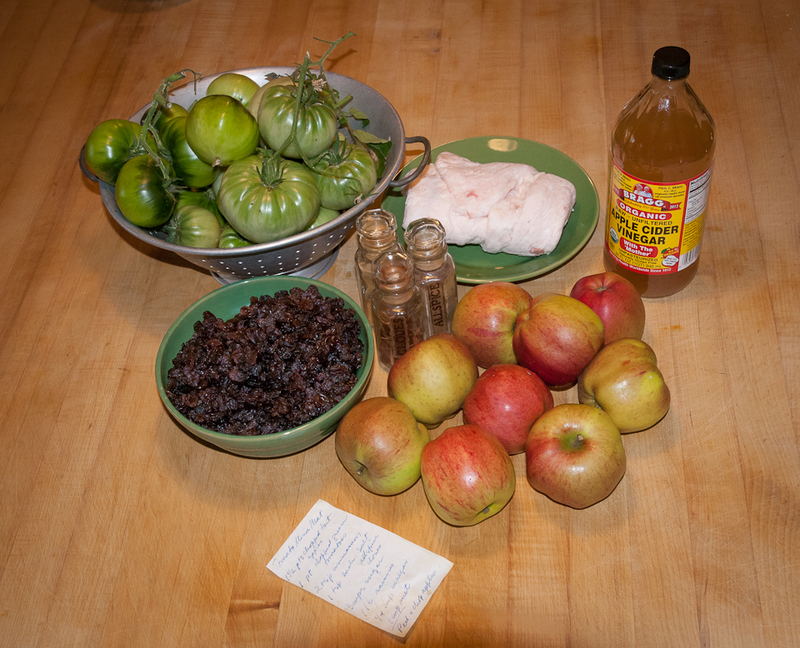 On the table, there will be our neighbor Laura’s cranberry sauce and my pear chutney. All these little tastes will play supporting roles to the big main flavors, but they’ll be most welcome. It wouldn’t be Thanksgiving dinner without them. 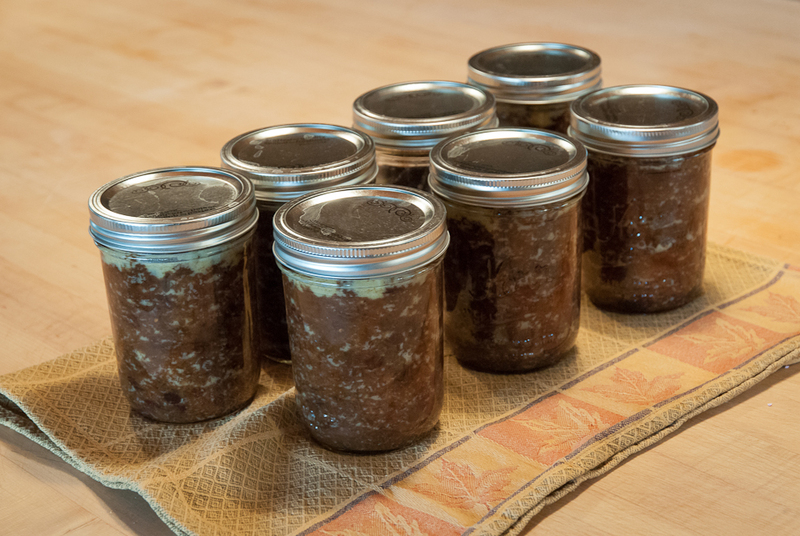 Fall feels like the time to make mincemeat and chutney. Spicy scents of cinnamon, ginger, and cloves, sweet and sour flavors of sugar and vinegar, savory overtones of onion, garlic and cayenne are all welcome on these cooler, darker days. And the season’s apples, pears and even the last green tomatoes lend themselves to long, slow simmering. My mother made green tomato mincemeat every fall, canning it in quart jars and using it through the winter for pies and cookies. I have a slip of paper on which I copied her recipe years ago, and those falls when I have green tomatoes I pull it out and make a batch or two. This fall I had enough green tomatoes for a double batch. Peel and chop apples, chop tomatoes, grind suet, mix all together, bring to rapid boil and simmer until thick. Pour into sterile jars and seal. The green tomatoes are the last of the Brandywines and Cherokee Purples picked from the very top of the indeterminate vines. The apples are Melrose, our latest season apple, a great keeper and possibly our favorite. Raisins and unrefined cane sugar, cinnamon, allspice, cloves and vinegar follow the list of ingredients. The variation this year is leaf lard instead of suet. I had some leaf lard from a recent pig purchase so I decided to substitute it, pork for beef. The melting point of lard is just a little lower than the melting point for suet (95 to 113 degrees F compared to 115 to 122 degrees F http://www.kingarthurflour.com/recipe/fats.html) so I think the substitution will work fine. I could also simply leave out the fat. My friend Debbie has left it out of her green tomato mincemeat sometimes and she says the mincemeat is fine. Still, one of the best things about a mincemeat pie is how the small amount of suet in the mincemeat absorbs into the butter-based pastry to create a wonderfully flakey crust. I’m trusting that the leaf lard will have the same effect. I used the Cuisinart to chop the apples and tomatoes and grind the leaf lard and mixed them and all the other ingredients into a kettle and set it on the stovetop to simmer. 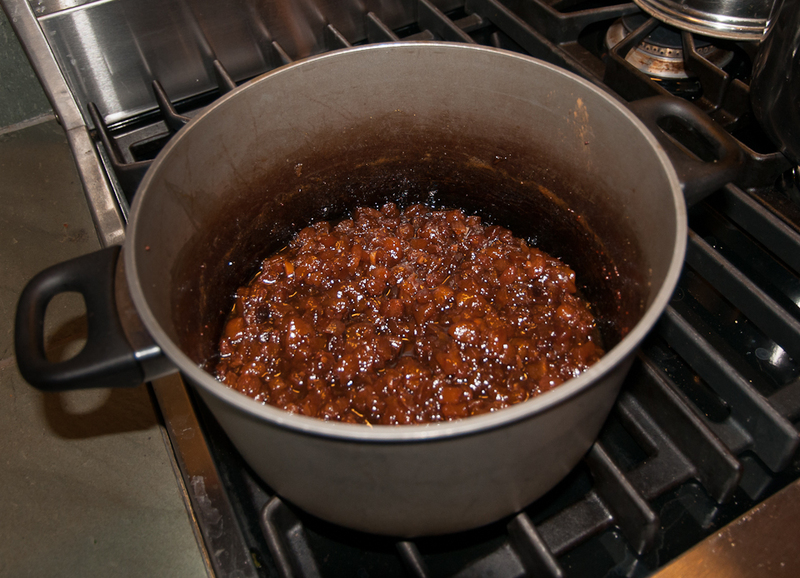 Very quickly, the fragrance of cloves, cinnamon and allspice rose from the pan and I was back in my mother’s kitchen and all the other kitchens where I’ve made green tomato mincemeat. The mincemeat simmers for about three hours, reducing and thickening with occasional stirring until the moisture from the apples and tomatoes evaporates and the rich, dark mixture is ready to can. I used pint jars this time because that’s what I had, processing them for twelve minutes in a boiling water bath. The jars all sealed and by the next morning, the mincemeat looked lovely, the dark tomato, apple, raisin mixture lightly marbled with fat. My mother never made chutney and I didn’t start to make it until a few years ago when I discovered how delicious it is with so many winter foods. It took a while to find a recipe that I liked enough to make again, but finally last year a Google search led to this simple pear ginger chutney recipe, now my favorite: http://homecooking.about.com/od/condimentrecipes/r/blcon41.htm I made it again this year. Combine brown sugar and vinegar in a large saucepan and bring to a boil. 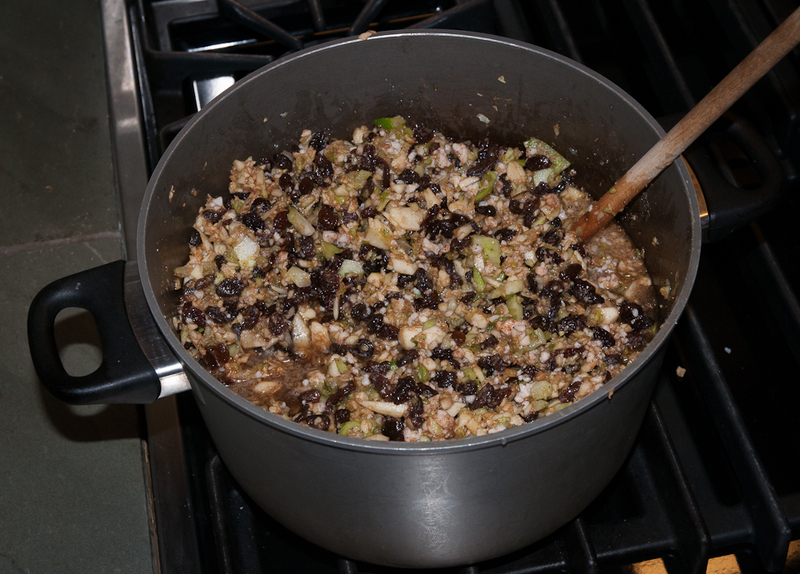 Add the pears, onion, raisins, ginger, garlic, cayenne pepper, salt, cinnamon, cloves, and mustard seed. Cook slowly, stirring from time to time, until the mixture is thick. The pears are Conference pears, an heirloom English variety that produces well in our small orchard. I’ve also used Orcas pears and even Comice pears in this recipe. 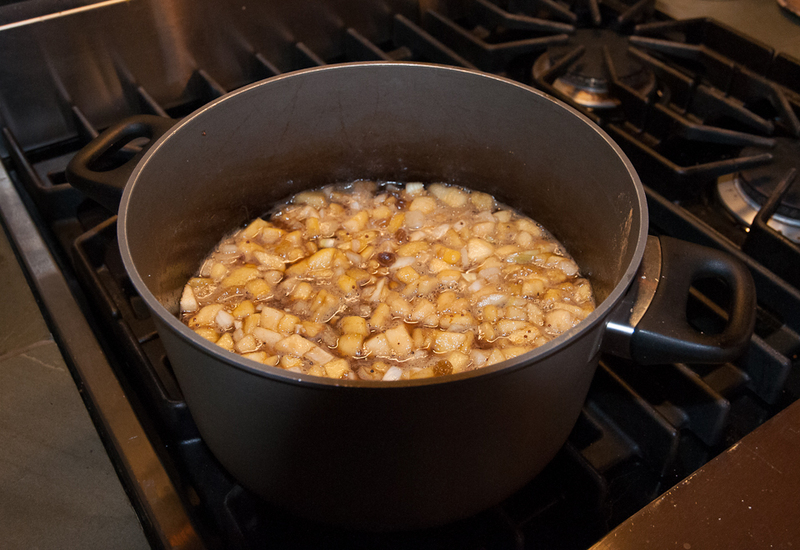 Instead of preserved ginger, which I didn’t have, I used candied ginger and increased the amount to about a cup. 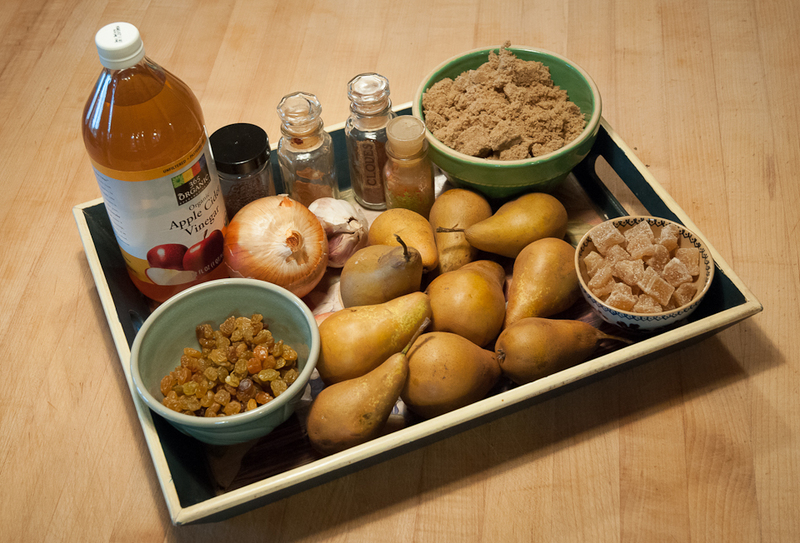 I peel the pears and chop by hand before adding them, onions, ginger, garlic and spices to the sugar/vinegar mixture. The chutney takes two to three hours of slow simmering to reach the thickness and rich dark color I like. Then I can it, usually in pints but sometimes in half-pint jars. It makes a lovely gift. Chutney pairs well with any food that needs a little zing of sweet/sour/spicy/hot flavor. One of my favorite ways to eat it is with a baked potato topped generously with grated cheddar cheese, a great lunch or easy dinner. Chutney is also delicious with savory tarts. Last night I served it with cauliflower cheddar pie. It’s wonderful with roasted meats like pork or chicken. And, of course, it’s classic with curries. 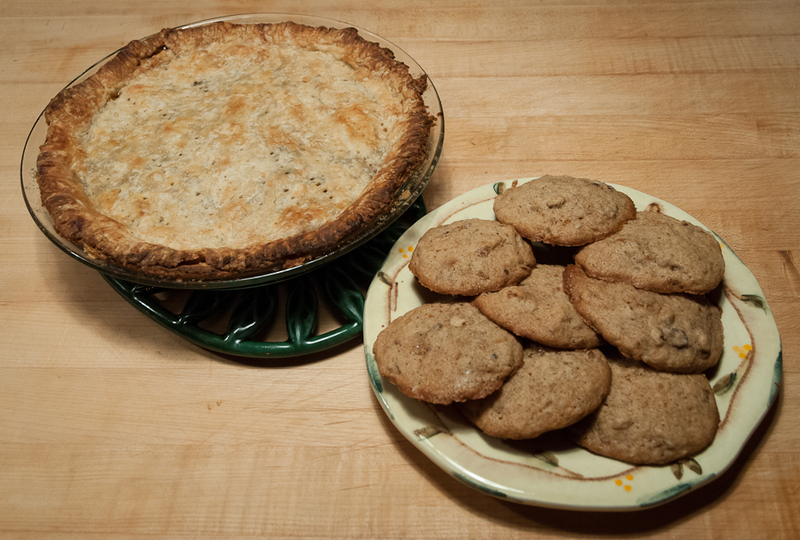 As for mincemeat pie and cookies: I just made both, eager to try this year’s mincemeat. The pie is lovely with a flakey crust and rich, spicy filling. And the cookies, called Mincemeat Goodies in my mother’s recipe box, are soft and spicy and perfect for bringing back memories of people and places from autumns past. Mixture should be almost stiff enough to stand. Bake 350 for 13 minutes.